Mamorukun Curse! was originally developed by G.rev, the co-developers with Treasure Co. Ltd. on games such as Ikaruga and Gradius V. The rush I got when I first started to understand the ammo-absorbing mechanic in Ikaruga was nothing short of exhilarating, as I’m sure many of you experienced the same! A great shmup (shoot-em-up) will usually have one or two defining mechanics that makes it stand up way above the rest. For Mamorukun Curse!, that mechanic is the Curse Bullet. The Curse Bullet is the key to surviving the game’s toughest fights, but can also be the double-edged sword that causes the player’s downfall. Specifically, the “Curse Bullet” will make a Cursed zone that weakens enemies’ defenses but at the same time boosting their shooting pattern. When defeated, a Cursed enemy gives off the highest amount of candy, Mamorukun Curse!’s collectible items for score, than when defeated normally. The Curse effect can also be applied onto yourself to power up your own shots to be even more powerful than shooting a “Cursed” enemy! This effect, of course, has a significant cooldown to the next “Curse Bullet” activation. Another benefit: when you start charging a Curse Bullet, it clears all enemy bullets on the screen. This makes for a very interesting risk/reward system; if you shoot the Curse Bullet and it doesn’t hit any enemies that can take a few more shots, the cooldown for the “Curse Bullet” is reset. This lets you bypass a lot of incoming fire almost indefinitely. However, this will only get you so far, as many bosses and enemies are able to take quite a bit of punishment when their defenses aren’t weakened or when your shots aren’t powered up by the Curse effect. Learning the multi-faceted Curse Bullet effects and balancing all its uses is where shmup fans will find their “A-HA!” moments! Shmup fans know how great games in this genre are hard to come across. Most are carbon copies of one another with minor differences, while a few great others take known mechanics within the genre and turns them on their heads! To learn more about Mamorukun Curse!, please head over to our official site, follow us on Twitter, and like us on Facebook. 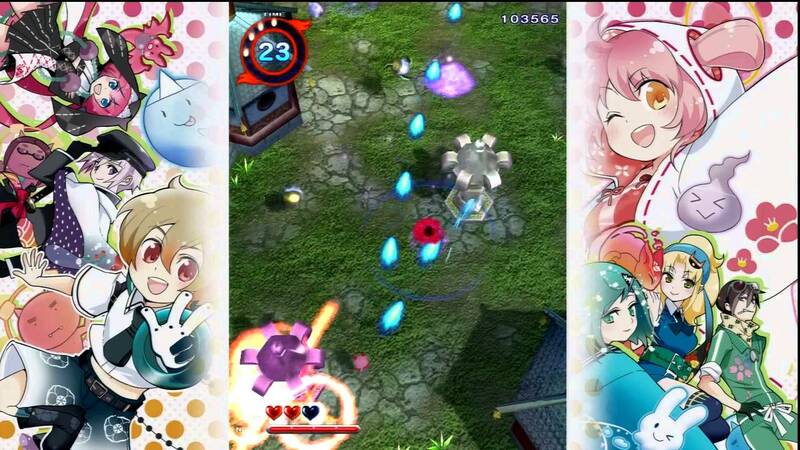 Mamoru-kun and his friends will arrive on PSN July 16th, 2013! I imported this game when it first hit PS3. I enjoyed it. Looking forward to buying it again in English. While the game certainly seems interesting, the title is somewhat misleading. When one thinks “Ikaruga”, they think Treasure. 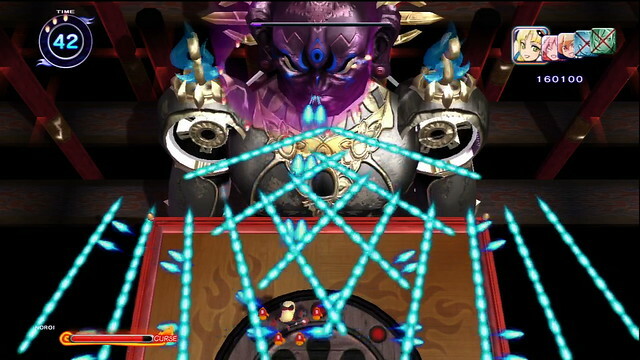 Treasure was the company that “made” Ikaruga. G.rev helped out, and the contribution of both parties cannot be faulted for the creation of one of the most popular shoot-em-ups of all time, but Treasure was the primary developer. I was quite saddened when I saw the title and the article did not claim that Treasure was actually developing another shoot-em-up. Hope there will be original Japanese voices in the game ? This looks awesome, and anytime I can have a game in english (or even better, french) and all the voices in Japanese, it’s pretty much as good as it gets. 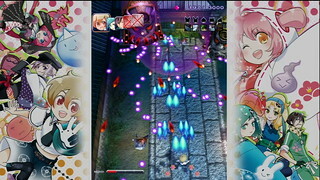 The full game retains it Japanese voice-overs and is subtitled in English. It doesn’t look like it’s coming for the Vita, but that’d be awesome! 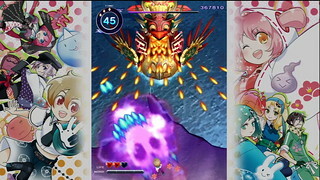 I’d like a Japanese Shmup on the beautiful OLED and the wonderful controls of the Vita. For now, I’ll stick with Sine Mora and Flying Hamster..
Could you guys imagine how AMAZING Ikaruga (or any G.rev shooter) would be on the Vita?! Option to orient the screen vertically, fully customizable controls…man. WHY ARE THERE NOT MORE SHMUPS ON VITA? Vitaaa pleaaaaase! I just want this game! I’m not the best at shmups but they are still ridiculously fun. Mushihimesama Futari being my favorite. Thank you for your support! Mushihimesama Futari is one of my favorites too! Along with Ikaruga (of course) and Psyvariar! Hopefully at some point, both questions will be answered. Preferably by playing them on my Vita. I imported the game and love it, will love it just as much when I rebuy on the PSN. Thanks for bringing this over! Thank you reson8er for the support! Any release date info plz? *Sorry by bad, didn’t notice the release date on the video, is it going to be on PSN ? I’m with everyone else on here – release this, any bring other Shumps, for and to the Vita. Lets all say it together, Sony has a PlayStation Vita, it would be really nice if the Vita was supported. Vita vita vita vita . Even worse is the fact that lots of great titles from Treasure and Cave are exclusive to MS.
PS3 is in dire need of more shmups, or rather, localized ones. Can we go ahead and get this for Vita? PSN could use more imports like this as well as PS Vita for sure. Didn’t get a chance to import this so I’ll be picking it up on day 1 for sure. Please consider bringing Caladrius to North America as well, and thanks for all the shmup love over the years! And thank you very much for the support and attention! I still have the Japanese demo sitting on my HDD. Absolutely love the lovely art style, the memorable soundtracks, and addictive gameplay. But you know what would make me really happy? A 1080p FullHD remake of Ikaruga, running at 60FPS on the PS3 or PS4 would be enough for me to buy 10 copies of the game. PS3? Awesome! While I own a Vita, I prefer to play games like this on a big screen. And unless Sony added a TV out to the Vita while I wasn’t looking, you can’t play Vita games on a big screen. Please, send this game to PSN br, here in razil, we can buy games too, and I would like very much to buy your game. I really wish someone would make Gradius 6 and release Gradius 5 as a PS2 classic. Good lord this game looks ridiculous. Definitely the most obnoxious audio I’ve heard since Claptrap beatboxing and wubwubwubbing through Sanctuary. Would love to purchase. Any hope for a retail release? Is it true this will include all the DLC as well? Name your price if you can satisfy those priorities. I’m a political consumer — I vote and support with my wallet based on the meeting of my priorities, and don’t mind paying “more” than what others would be willing to, to get what I desire! This looks zany and amazing! I am a proud owner of Ikaruga, Gradius V, and even Raiden III published by you guys at UFO! The PS3 has a dire shortage of shooters, so this is very welcome news. I will happily buy this game as soon as I can. I will enjoy every minute of it. Now the big question: Which are the best characters to use? This looks really cool… I’ll definitely pick this up. But is there any chance of the Treasure folks working on a port of Radiant Silvergun? I’ve never gotten a chance to play it, despite owning a Saturn and loving all the other shmupping on it, it’s just too rare. Ikaruga was remade at least twice that I know of, but a PSN release of that wouldn’t be a bad thing at all, or even better if it’s on a compilation disc with some of their other amazing bullet-swarmeramas. The Origins of Physics-based Action Platformer Giga Wrecker Alt.